I can say without a doubt that I was made to be in a classroom. I followed the footsteps of my father, a 35-year middle school math teaching veteran, into this challenging yet rewarding career. My college experience began as a community college student at Lakeland College in Mattoon, Illinois. From there, I received a Bachelor of Science in Mathematics from Eastern Illinois University and a Master of Science in Mathematics from Southern Illinois University. I accepted a tenure-track faculty position at Parkland College, where I have taught developmental and college-level courses for 15 years. I had the opportunity to begin writing textbooks shortly after I started teaching at Parkland. My then department chair and mentor, James W. Hall, and I co-authored several textbooks in Beginning and Intermediate Algebra. In the fall of 2011, our department began discussing the idea of creating two tracks through our beginning and intermediate algebra courses. The idea stemmed from two issues. First, most of our beginning and intermediate algebra students were headed to either our Liberal Arts Math or our Introduction to Statistics course. Second, we wanted to beef up intermediate algebra to better prepare those students who were headed to college algebra. These were two competing ideas! Increasing the algebraic rigor of these courses seemed to “punish” students who were not heading to college algebra. With the two track system, we implemented a solution that best serves both groups of students. 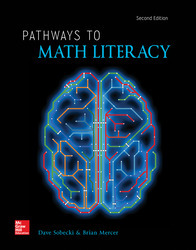 I have to admit that I was initially concerned that offering an alternate path through developmental mathematics for students not planning to take college algebra would lead to a lowering of standards. However, my participation in our committee investigating this idea led me to believe it was possible to offer a rigorous course that was exceedingly more appropriate for this group of students. Since there were no materials for the course, I began creating my own and was paired by McGraw Hill with Dave Sobecki. Together, we have created the material that I have been using for class testing. After a semester and a half of piloting these materials and seeing the level of enthusiasm and engagement in the mathematical conversations of my students, I am now convinced that this is an ideal course to refine and offer. As a trusted colleague told me, “this is just a long overdue idea.” Outside of the classroom and away from the computer, I am kept educated, entertained and ever-busy my wonderful wife, Nikki, and our two children, Charlotte, 6 and Jake, 5. I am an avid St. Louis Cardinals fan and enjoy playing recreational softball and golf in the summertime with colleagues and friends.